The quality of a business traveller’s itinerary can make or break a business trip. While that might sound dramatic to some, any well-seasoned road warrior will tell you that a bad itinerary can mean a lot of extra worrying about the next leg of travel – when you should be focusing on the meeting you flew around the world to attend. Business travellers know that mix-ups and delays are extremely costly for their organisation and can even affect their own wallet. Unsurprisingly, this makes it difficult to sit back and enjoy the journey. One of the ultimate worries for a business traveller is getting part-way into a business trip and discovering a gap in your itinerary – whether that’s a missing connecting flight or finding out there’s no accommodation booked. Sometimes this can be easily fixed, for example if an itinerary excludes a trip element that was booked “off-policy" or a travel manager simply forgets to add something to the document. But, until the mistake is cleared up, the stress is very real for travellers in unfamiliar locations. In the worst-case scenarios, travellers might end up stuck in an airport waiting for the next available seat on a flight home, have to spend a night in a different hotel they might not feel safe in or even be forced to cancel the meeting they traversed continents to attend. While the obvious solution might simply be constant vigilance and double triple quadruple checking every itinerary your TMC manages, human error is unfortunately inevitable. For complete peace of mind and the perfect itinerary you need an automaton apprentice to lend a hand. There are a range of products available that automatically check upcoming departures for any gaps in the itinerary and notify you immediately so you can remedy the situation as soon as possible. 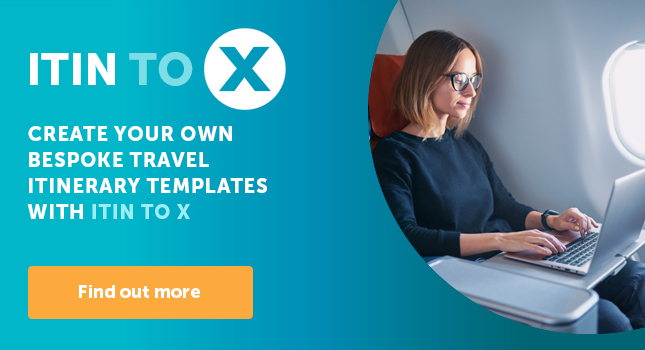 Not only does this ensure your travellers have a smooth trip, thereby solving one of business travel’s biggest headaches, but it’s fully automated and needs virtually no input from you. Empowering you to deliver the perfect itineraries without adding any extra hassle. What’s worse, often this information is spread across a multitude of emails, booking confirmations and disparate travel documents. An easy way to help business travellers feel less stressed, using nothing but the humble travel itinerary, is to simply ensure that all necessary trip information can be found in a single document. To take this idea to the next level and really boost your standing with clients, you can reduce information overload by taking more care over the design of itinerary documents. The last thing travellers need when they’re rushing for a flight is an itinerary that’s clogged up with third-party adverts and littered with a hodgepodge of fonts in different sizes – an itinerary shouldn’t require more rereads than Gravity’s Rainbow! Instead, you should aim to deliver an itinerary document that’s sleek, streamlined and simple, so travellers can find the required information at a single glance. As well as enhancing the user experience, this will demonstrate that your TMC understands what’s important to business travellers. There’s no need to worry about your pedigree as a designer or developer either. There are many products that export data directly from your PNR into custom itinerary templates. All you need to do is let your business travel technology partner know how you want your itineraries to look and they’ll ensure an incredible looking end-product for your clients. By now, any travel manager worth their salt should understand what bleisure is, but that doesn’t mean we’ve fully adapted to how we work around the trend. In fact, many of the TMCs we speak to have reported that some clients don’t even cover bleisure in their travel program. Should we help your employees add leisure elements to business trips? Do you want your employees to have access to GDS content if booking leisure elements? Where exactly does our duty-of-care end during a bleisure trip? Answers to all these questions will impact your operations but the latter may have worrying implications surrounding liability. Obviously, nobody wants to inadvertently put a traveller at extra risk and the modest itinerary can help solve a common worry affecting TMCs and business travellers alike. By empowering travellers to add leisure elements to their itinerary, (either using your own bespoke itinerary app or emailing you the details) they not only gain a better guide to their entire trip, but there’s also a level of informal oversight – preventing them from falling into the void. You can spend hours preparing the perfect business trip, but it’s all for nothing if travellers forget the details of the next leg of their journey and aren’t able to access their booking details. For some travellers this is simple because a printed itinerary in their pocket means 24/7 access, wherever they are. However, document delivery is becoming more complicated for TMCs, as travellers are more frequently choosing to access itineraries online, like the 72% of millennial business travellers who use their smart-device to check their trip details every day – according to GBTA’s Business Traveller Sentiment Index. The perfect itinerary solves this issue simply by being readily available in each traveller’s preferred format and device, without any negative effect on quality, readability or load times. Your response to this challenge should be delivering itineraries that are easy-to-read and accessible regardless of how they are accessed. Another way top-tier TMCs are helping cut down on business travel stress is to include travel times between ground destinations in itineraries. Adding the details of how long it’ll take to travel from hotel to meeting room or airport, along with the phone number of a reputable taxi company, is the perfect way to ensure business travellers find it easier to relax during a busy business trip. Packing the perfect bag for a business trip is an art-form that very few people master. There’s no way that stuffing all the essentials into a bag while still complying with ever-shrinking carry-on allowances doesn’t require breaking the laws of physics. You could even include some vital information about any glaring cultural differences they’re likely to encounter. Although this might see like overkill, a quick note that explains the workweek in the Middle East is Saturday to Thursday could save plenty of embarrassment. Likewise, knowing that in Japan it’s extremely rude to be late for a business meeting but acceptable in social situations can help avoid a mishap – especially as in many areas, particularly Latin countries, the opposite is true! Although travel itineraries are used every day by business travellers across the globe, TMCs would be wise not to downplay its importance. With enough care and attention, an itinerary is the Swiss Army knife of business travel and can help end some of the industry’s common complaints – from handling the bleisure trend to reducing your travellers’ stress level. Click here to find out more about how our Itin to X solution can help your TMC stand out from the competition.